Paver Driveway vs Asphalt Driveway: Who Wins? When it comes to picking a new driveway, you’ve got options. However, we’re going to put away concrete and gravel and look at the two major sides of the spectrum: asphalt and pavers. One is a tried and true driveway material that will have existed in at least one home you’ve bought or rented over the years, the other is an intriguing option with some special benefits. Below are the three things to keep in mind when you’re making the decision and talking to your driveway contractor about your options. Asphalt is known for its affordability, only beaten out by an unimproved or gravel driveway in terms of cost. 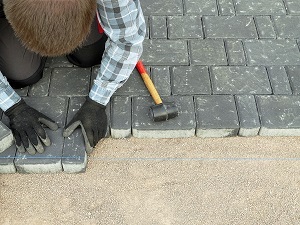 Pavers, on the other hand, are much more manpower and resource intensive, as individual pavers cost more than the equivalent layer of asphalt, and must be hand placed. Much of the rest of the process should be similar, with the sub-layers of the driveway produced in a similar fashion requiring excavation, and then layers of sized gravel and sand to produce the platform for the driveway material. As pavers tend to be thicker than the layer of asphalt, the excavation may be slightly deeper. So, what offsets the cost of pavers? One of the major features is that pavers age much better than asphalt, with less maintenance required. To maintain an asphalt driveway, a layer of seal coat should be applied within six months of installation, and then maintained with a new coat every other year. Cracking due to moisture and other issues can go from hairline to pothole if left untreated. Pavers, being made of more durable materials and being separate units, are much less prone to breaking and do not require treatment. If one does break, you can easily replace the single unit. Permeable pavers also allow water to pass through the driveway, which can help avoid pooling or flooding in heavy rain – something that can’t be duplicated with an asphalt or concrete driveway. Many people who look at pavers as an option also have aesthetics in mind. Asphalt is traditional, but also unchangeable: asphalt will always be black. Pavers come in an array of colors, sizes, and styles they can be set in. This added design stage does mean an overall longer project and cost, but also a much more visually striking driveway (and therefore yard and curb appeal). Asphalt is cheaper than pavers in up-front installation costs. Pavers are lower maintenance and generally have a longer lifespan. You have more design and visual variety options with pavers. We hope this comparison of two of the most popular driveway options has provided some guidance on the type of driveway you’re interested in having. If you decide to not go with asphalt, contact Greener Horizon. We do installations of pavers, gravel, and concrete driveways in Massachusetts and Rhode Island, and would be happy to provide a free consultation on your options.